Not surprisingly, Obama called it the best sushi he has ever eaten, joining a long list of celebrities who have lined up for their own piece of Jiro’s dream. This includes the likes of TV celebrity chef Anthony Bourdain, master French chef Joel Robuchon (who has a number of satellite restaurants in Tokyo), and actors Tom Cruise, Hugh Jackman, and Anne Hathaway. 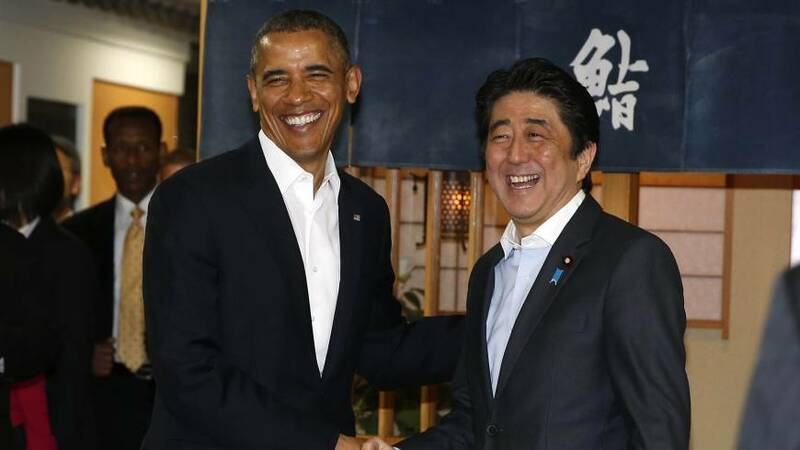 Obama’s trip to Jiro’s brings to mind other recent examples of casual dining diplomacy. Over ten years ago, then Japanese Prime Minister Junichiro Koizumi took former President George W. Bush to an Edo-themed restaurant in the Roppongi district called Gonpachi, which had inspired the backdrop for a famous fight scene in Quentin Tarantino’s first “Kill Bill” movie. President Obama has also taken former Russian President Medvedev and Vice President Joe Biden for hamburgers at Ray’s Hell Burger in the Washington, DC suburb of Arlington, Virginia. Ray’s does not claim interior decor as a strong point, but it’s burgers are simply amazing. (Not too long ago, Ray’s moved across the street from its original location and was renamed “Ray’s the Third,” but you can still get such great stuff as their foie gra burger). It also underscores how some of the best food in Tokyo are served in modest, perhaps unexpected surroundings. Sukiyabashi Jiro is located in a nondescript basement corridor next to the Ginza subway station. Another Michelin-starred sushi restaurant named Sushi Saito was located just inside the entrance of an indoor parking lot across the street from the U.S. Embassy, before moving to a new home earlier this year (not sure where, but someone told me it was somewhere in Ebisu). Of course, there are also the countless, less exulted eateries that are hidden away in backstreets and basements across Tokyo. Even in America, you can find places like Ray’s Hell Burger in an old shopping center. Anyway, hope you liked the sushi, Mr. President. Enjoy the rest of your trip to Asia! This entry was posted in Food, Sushi and tagged Asia, hamburger, Japan, Jiro, Obama, Ray's Hell Burger, Shinzo Abe, Sushi, Sushi Saito. Bookmark the permalink.